I just have to say I regret not starting this several years ago...or at least earlier this year when I first found out about KTVA when researching online singing programs. I have been focusing on control, vowel modifications, breath support, and I have been recording and analyzing myself. I have also posted a few scales on the forum for some feedback, and have received some great information. I have worked 5 - 6 days per week on the Volume 1 exercises. I have been trying to avoid singing in the car or playing my acoustic guitar and singing some of my favorite cover songs. Until last night I pulled out my guitar and sang some of the songs I enjoy. WOW! What a difference even two weeks can make! I can't wait to see how my voice will grow in the next two months! The next two years even! One of my biggest issues I would have besides control is bridging. I would just avoid it, and jump in to the higher notes which placed straining on my throat. Well, I recorded myself last night singing a song I would struggle with months ago, and it sounded better... LOTS better. It's still not good enough to put up yet, but it is definitely improved by a mile. And it involves some bridging to get to the higher notes on the chorus. I believe I have already stretched my chest to where I don't need to start my first vowel modification until Bb3. It used to be around Ab3 so I've already stretched it one full step (I'm a guitar player so if that's not the correct term, forgive me) in just two weeks! I am now able to sing the higher notes after incorporating the modifications (I used to not be able to pass D4 in the exercises even though I used to "jump" into higher notes in head voice, even though they didn't sound that good). Anyway, last night I did the vocal exercises and then pulled out my acoustic. The first several songs sounded so much better. And, I couldn't tell if I was just singing too loud (as I tend to oversing) or I just had better resonance. Well, it definitely did not place as much strain on my throat. I sang for about an hour and a half with my guitar and started noticing some fatigue, but not really any strain. I had to finally quit, but I don't feel sore this morning or anything, so that's good. The last few songs started to suffer as I feel as though I was falling into some old habits and plus I was getting tired. I still feel as though I have a lot to work through on Level 1 and will continue until I am sure I'm ready to move on to Level 2. But, yes, this program is AMAZING! I have learned more in two weeks than I've learned my entire lifetime trying to be "self-taught" and a couple months of singing lessons years ago. 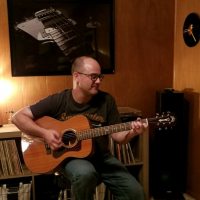 I guess I thought since I was mostly self taught on the guitar, I thought eventually I would be able to "pick up" singing. Uh, no. The voice is a complicated instrument, but it can be learned. Ken Tamplin teaches it in a way that makes sense. I'm excited about my growth in this program! Again, I can't wait to see how I sound this time next year! I regret not starting this years ago, but there's no time like the present, right!?!?! I did the same thing, Jason. I had spent two and a half years trying to make the world's most famous singing method work. After giving it my all for all of that time, I realized that that other program was full of gimmicks and hot air, not success. I lost all of that time and money I spent on it. Then I found Ken's videos while researching Belting, Appoggio, and Open Throat Singing. At first I thought "who is this guy?" Then I heard him sing, and I thought to myself, "if I could just sing a FRACTION as good as him, I'd give anything!" But I thought I was too poor to afford it, and I waited. A Whole Year went by. I finally realized that no money was going to fall from the sky, I either had to break down and buy this program, or I could just watch my life pass by and never learn to sing any better. SO I bought it a YEAR later. I lost a WHOLE YEAR that I could have been getting better. I was no richer financially. I just bought it. Now or never... NOW! It was the best thing I ever did for myself. Call it a birthday present, Christmas present, anniversary present... whatever. Just do it! It works. Anybody who is on the fence about whether or not Ken's program is worth the money, listen to us. It has changed our lives. It's the best thing you can do for yourself if you're a musician or want to learn to sing. The other programs don't work. I've spent thousands on them and wasted years. I'm telling you this so that you can save yourself that grief, time, and expense. There are lots of phony, self-proclaimed "vocal coaches" out there that will take your time and money. Cut to the chase. Learn to actually sing. Don't waste time like Jason and I did, waiting for the right time to come along and tap you on the shoulder. Jason, in a year, in two years, you are going to know so much more than you know now, and be very confident with your voice. You will continue to be happier and happier that you went for Ken's program. Thanks so much for the support and encouragement, Bob. Rock on! Jason if you want, can you please put a recording or a video to hear your progress? @Tonyr yes I was planning on it. I did post some Ah scales, but not lately showing my progress. @jasondotj but not doing scales, singing a song would be really good. @Tonyr that will take some time as I want to feel comfortable putting up a song. @ ok that's fine I understand. Yes It's amazing indeed! Time flies,i realised how important that is to be on purpose every day! Thank you all. Yes it's going well. I'm going pretty strong on Level 2. I upgraded to the 2.0. I am hoping to hit level 3 in the near future! its a great feeling isnt it? glad singing is working out for ya. its a wonderful feeling to let go of our voice and achieve what we love. Keep up the good work. Practice safely. I'm totally pumped reading your story / stories. Congratulations to both of you. I'm an old guy and I've been working volume 1 for about two months. I can't say I've got a beautiful voice at this point but I was singing along with my playing this evening and could effortlessly hit the notes in "Little Wing" that I'd previously, and unsuccessfully, strained for. It feels good to hit the notes without doing damage. Because music has been my lifelong hobby, this program was worth the money to me. In one way it's almost a mystical thing when I revisit old tunes and in another way there's the everyday, expertly guided practice to credit.